Mouse anti Human CD29 antibody, clone JB1B (MCA1189) used to demonstrate CD29 enrichment in porcine extracellular vesicles released by mesenchymal stem cells using western blotting. B: EVs express common EV (CD9, CD29, and CD63) and MSC (CD73 and CD105) markers. Integrated transcriptomic and proteomic analysis of the molecular cargo of extracellular vesicles derived from porcine adipose tissue-derived mesenchymal stem cells. Mouse anti Human CD29 antibody, clone JB1B recognizes human integrin beta1, also known as CD29, Fibronectin receptor subunit beta, Glycoprotein IIa or VLA-4 subunit beta. CD29 is a 798 amino acid ~130 kDa single pass type-1 transmembrane glycoprotein containing a single VWFA domain. Specificity for CD29 has been confirmed with integrin beta1 transfectants and by reciprocal preclearing of beta1 reactivity with anti-beta1 antibody. 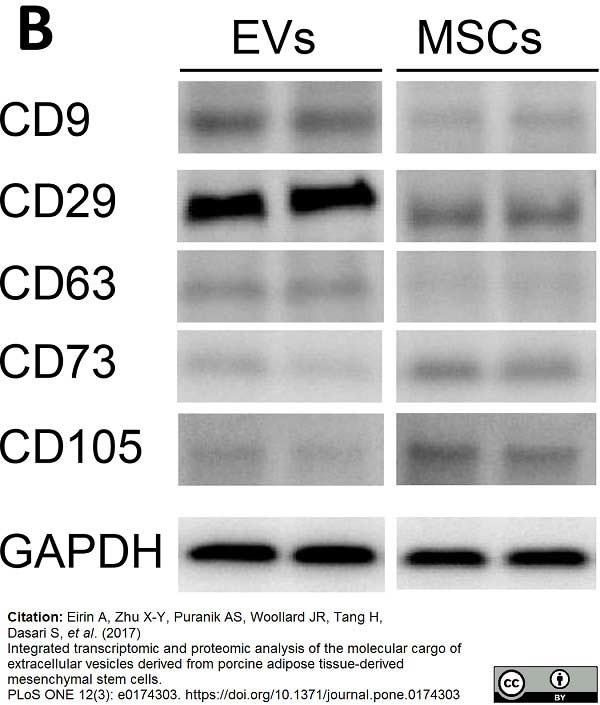 Mouse anti Human CD29 antibody, clone JB1B has been successfully employed for the detection of porcine CD29 in formalin fixed, paraffin embedded material (Papageorgiou et al. 2014) and also to stimulate the adherence of several cell types (Wilkins et al. 1996). The removal of azide is recommended prior to use in functional assays. Spleen cells from immunized BALB/c mice were fused with cells of the NS1 mouse myeloma cell line. Stupack, D.G. et al. (1994) Control of lymphocyte integrin function: evidence for multiple contributing factors. Cell Immunol. 155 (1): 237-45. Wilkins, J.A. et al. (1996) Control of beta1 integrin function. Localization of stimulatory epitopes. J Biol Chem. 271 (6): 3046-51. Batista da Silva, A.P. et al. (2004) The major outer sheath protein of Treponema denticola inhibits the binding step of collagen phagocytosis in fibroblasts. Levite, M. et al. (2000) Extracellular K(+) and opening of voltage-gated potassium channels activate T cell integrin function: physical and functional association between Kv1.3 channels and beta1 integrins. J Exp Med. 191: 1167-76. Bass, R. et al. (2005) Regulation of urokinase receptor proteolytic function by the tetraspanin CD82. J Biol Chem. 280: 14811-8. Clark, K. et al. (2000) Production of recombinant soluble human integrin alpha4beta1. Papageorgiou, I. et al. (2014) Interaction of micron and nano-sized particles with cells of the dura mater. J Biomed Mater Res B Appl Biomater. 102 (7): 1496-505. Takaki, T. (2006) Interferon-gamma inhibits collagen phagocytosis in human fibroblasts by inducing subcortical actin assembly and reducing ability of beta1 integrin to bind to collagen. Eirin A et al. (2017) Integrated transcriptomic and proteomic analysis of the molecular cargo of extracellular vesicles derived from porcine adipose tissue-derived mesenchymal stem cells. PLoS One. 12 (3): e0174303. Meng, Y. et al. (2018) The metabolic syndrome alters the miRNA signature of porcine adipose tissue-derived mesenchymal stem cells. Cytometry A. 93 (1): 93-103.